Over 20% more accurate than previous versions–and over 60% more accurate than non-medical Dragon. Includes vocabularies for over 90 medical specialties and subspecialties. 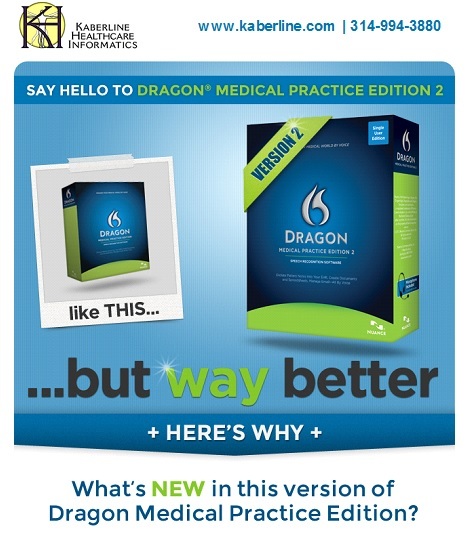 With Microsoft's free Remote Desktop Connection software, you can use Dragon Medical Practice Edition 2 from a local Windows computer on which Dragon Medical Practice Edition 2 itself is not installed. While Dragon Medical Practice Edition 2 is running on the server, multiple Windows clients can use it simultaneously. Dragon Medical Practice Edition 2 protects sensitive and confidential patient information by supporting encrypted network file storage of speech files, helping your organization satisfy HIPAA privacy and confidentiality guidelines. Program your PowerMic II buttons to run a Dragon Medical Practice Edition 2 function or user voice command. Dragon Medical Practice Edition helps clinicians – including physicians, nurses, nurse practitioners, physician assistants, therapists, and other care providers – efficiently navigate and dictate medical decision-making and treatment plans directly into a patient’s electronic record. Call us now for a custom quote, 314-994-3880. Reduce transcription and the cost of documentation.Using speech recognition technology, clinicians dictate, edit and sign medical records at the point of care, eliminating as much as $12,000 in annual transcription costs. Includes library of macros for standard notes and “medical normals” by body system. Automatically detects poor audio input and alerts the user, offering advice to remedy the situation and improve accuracy. All major EHR systems, including those from Allscripts™ MyWay™, Allscripts Professional, NextGen Ambulatory EHR™,eClinicalWorks®, athenaHealth®, Henry Schein MicroMD®, Practice Fusion™, and Greenway®.